Editor Mary Petrusewicz distilled (condensed?) his 'monumental' 5-volume (2,500-page) biography into a single volume. The juciest of the juice. The essence .. sort of like » an espresso, which is the 'pressing out' of the coffee's essence. 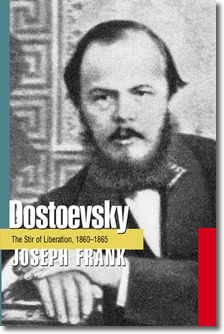 Joseph Frank has a handle on Dostoevsky. He shines such a bright light on the nineteenth century Russian (1821-1881). Very illuminating. The cover (of the cheapo $18 paperback version because the hardback was so expensive - $33) feels like felt. I am very tactile, so I certainly appreciate the attention to detail. It gives me a nice feeling when I hold it in my hands. (Similar to how a Moleskine feels.) And all this with a cover with a » black background. After an enlightening 5-page preface (written in 2010), Joseph Frank begins. Let me quote for you the very first sentence ..
» Of all the great Russian writers of the first part of the nineteenth century -- Pushkin, Lermontov, Gogol, Herzen, Turgenev, Tolstoy, Nekrasov -- Dostoevsky was the only one who did not come from a family belonging to the landed gentry. As the weeks pass, I will share some of the more remarkable insights that I gleaned from this book, from this bio, from this outstanding biography. I mean, I put it up there with Walter's bio of Einstein .. and even the one on Oppenheimer, another book that was » 25 years in the making .. both of which will easily endure for a century. Normally a person doesnt spend 25 or 30 years researching a single person, or a single topic .. unless that person is one fascinating character (or subject). Quality has staying power. You know. The relevance that spans the centuries. I mention a few other things that Joseph Frank wrote » here. Movable Type Open Source (MTOS 5) » The Final Freebie from Six Apart (again) was the previous entry in this blog. 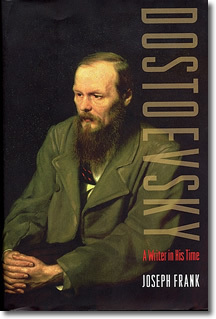 Rad vs Hemingway on the Key Factor Behind Dostoevsky's Genius is the next entry in this blog.